Alysicarpus longifolius sensu Span., Alysicarpus violaceus Schindl., Alysicarpus violaceus sensu (Forssk.) Schindl., Alysicarpus wallichii Wight & Arn., Hedysarum rugosum Willd. Red moneywort (Alysicarpus rugosus (Willd.) DC.) is an upright robust annual legume growing up to 60-150 cm with oblong to lanceolate leaves 10 cm long x 2 cm wide. Its reddish flowers form a dense mass in racemes up to 10 cm long. It can grow on residual soil moisture during the dry season and can provide green forage when most associated forages have dried up (Kallah et al., 2000). Annual dry matter yields range from 3000 to 7500 kg/ha when cultivated alone. In Zambia, this plant is leafy, fairly persistent and considered moderately productive (Van Rensburg, 1967). In addition to its use as forage, its seeds are reported to be a famine food (Freedman, 2009; Cook et al., 2005). Alysicarpus rugosus is native to tropical Africa, Madagascar, temperate and tropical Asia, and Australia. It is found at altitudes up to 1400 m in the foothills of the Himalayas. Its grows in areas with 600 to 1500 mm annual rainfall and thrives when rainfall exceeds 900 mm. It prefers sandy loam and clay soils and is poorly adapted to acid-infertile soils. It may be found in grassy and wooded savannahs, and path sides (USDA, 2009; Ecocrop, 2009; Cook et al., 2005). Red moneywort is a non-aggressive species and is thus suitable for intercropping in semi-arid regions (Njarui, 1988). Alysicarpus rugosus is very palatable and is recognized as a potentially good source of fodder. It has a good protein content (Kallah et al., 2000). It is introduced into sown pastures during the dry season, in order to produce fresh fodder two months later for cattle. 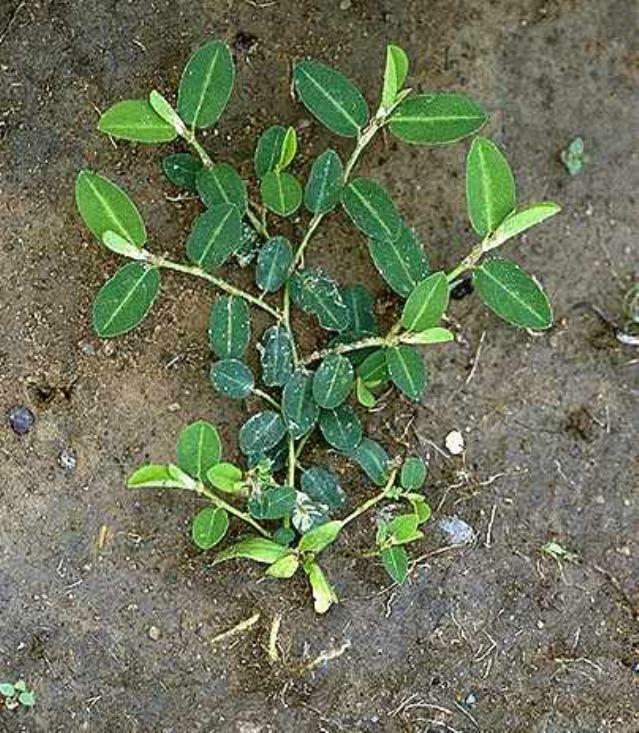 In India, Alysicarpus rugosus hay replaced green alfalfa and provided 50% of the protein requirements of crossbred dairy weaner cattle without reducting live-weight gains (Patel et al., 1991). Live-weight gains were maximised at 40% replacement of crude protein requirements (Cook et al., 2005). Njarui, D. M. G., 1988. Techniques for introducing forage legumes to the small-scale farmers of the semi-arid region of Kenya. In: PANESA/ARNAB, Utilization of research results on forage and agricultural by-product materials as animal feed resources in Africa, Proc. 1rst joint workshop, Lilongwe, Malawi, 5-9 Dec. 1988, Addis Ababa, Ethiopia. 833 pp.